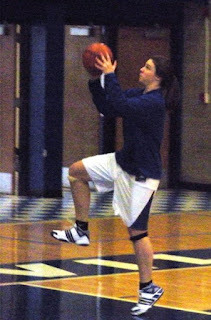 EMILY PLAYED FOUR years of varsity basketball for the Quincy Blue Devils. It was a challenging experience for her and it helped toughen her up and deal with adversity. I spent a lot of long winter nights watching her play at QHS Gym, and have good and not-so-good memories from 33rd and Maine. Whig Sports Editor David Adam asked if I would cover the QHS vs. West Hancock game Tuesday night, and I jumped at the chance. So I went to QHS Gym for the first time in eight years. Eight years! 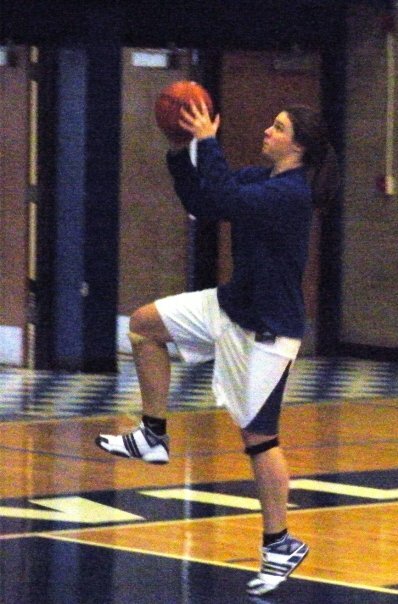 I can't believe it's been that long.Quincy ended up winning and I think I saw the Blue Devils make more 3-pointers last night than in Emily's junior and senior years. Click here for the story. Emily was a post player. She would have loved playing with this year's quick and aggressive guards. In her junior and senior years, her team had trouble simply dribbing out of the press and getting the ball past halfcourt. I think she would have thrived in current QHS coach Brad Bergman's system. I saw a lot of familiar faces and it was great to be back at the gym. Thank you, coach Bergman and this year's Blue Devil team, for taking me back in time and helping me stay in the moment. I felt rusty and it wasn't the best of stories, but it was a positive experience and I hope to see more QHS games again. Labels: Herald-Whig sports, No. 44, Quincy High School Blue Devils, Trump can't dribble either.